While it’s not hard to find an iPhone case that can protect your handset from water and dirt, a rugged external battery pack is a little more difficult to come by. But after a successful run on Kickstarter last year with its Blast battery, Limefuel is once again returning to the crowdfunding platform. 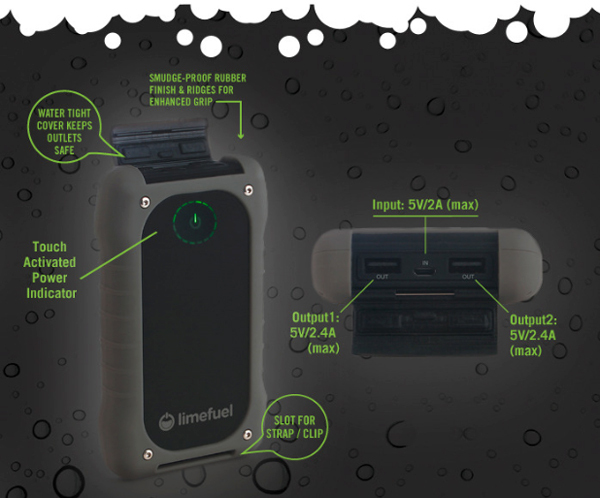 Its new Limefuel Rugged is dust tight, waterproof, shockproof, and crushproof. It has even survived being run over by a car. Here’s a video about the device. Click here if you can’t see it. Dual USB ports can charge two devices simultaneously. The outer shell of the battery is covered with a smudge-proof rubber finish and finger ridges for enhanced grip. For a pledge of $50, you can snag a 10,400 mAH version of the battery. For $20 more, you can receive a 15,000 mAH battery pack. And if you’re really in need of some more power, a $150 pledge will net both the 15,000 mAH battery and the L240X Blast – a 24,000 mAH cell. The 15,000 mAH battery can recharge any iPhone 5 up to 10 times, which is pretty amazing. It even has enough juice to completely charge an iPad Air almost twice. In just two days, the project has easily blown past its $30,000 funding goal. With 28 days left, more than $50,000 has been pledged. All batteries are estimated to ship in May. For other recent accessory news, see: This Week In Accessories: Grace Digital Encore, Zagg Arsenal Case And More, Fitbit Issues A Voluntary Recall Of Its Force Fitness Tracker, The Pocket Tripod For The iPhone 5s/5 Fits In Your Wallet.